it seems that someone comes out of nowhere and flips the model on its head. We see it all the time in this modern internet age. Companies like Uber, Airbnb, and Google (via a variety of enterprises) continue to break down the walls and establish new and innovative processes for consumers to integrate into their daily lives. From an outside perspective, it would appear that the Learning Market is ripe for such an opportunity. However, I would like to make the case that our industry is not as ripe as one would imagine. The Learning marketplace, in particular, has been very adaptive throughout its entire existence. It seems that Training personnel are always focused on new and innovative teachings, and designers are obsessed with developing an open platform that can accommodate all these visionary changes that we as learning professionals would wish to implement. As a result, the largest changes that we are currently experiencing in this market are alarmingly innovative, however, they all work within the framework that is in place. 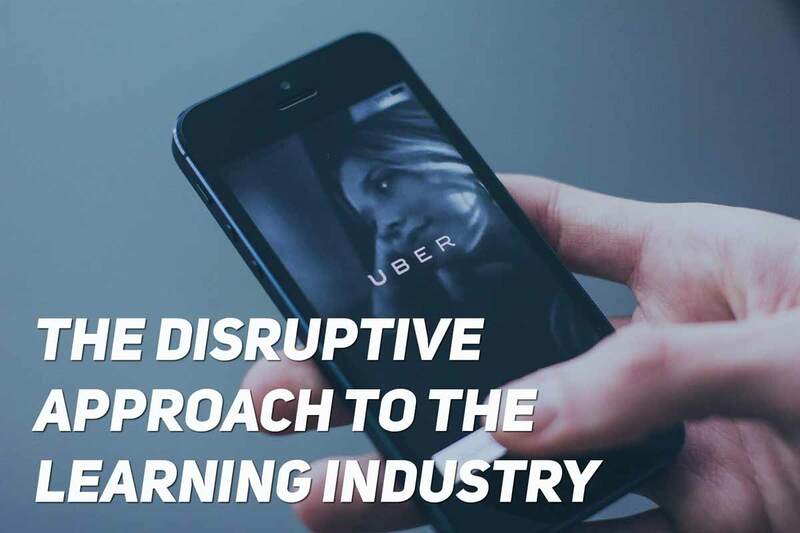 The grand scheme of training from a disruptor?s perspective perhaps is not completely re-inventing the framework of the wheel, but instead, the successful disruptor may have to come in with a perspective far more internal to the learning process itself. Think of the industry and how it currently stands, and the new features that are being introduced within the context of your training environment. New features such as mobile learning, gamification, and microlearning, all serve a need that was not immediately identified within the context of a training environment. That need being, how to motivate your workforce to action upon the training, as well as making said training accessible at any time, in any place. Microlearning in particular caters towards reinforcing ideas, motivating students due to the brevity of the content, as well as creating an environment where the user feels like they have accomplished something within that same very short time span. The innovators in this environment have created these amazing new functionalities, however, they have chosen to do so in a method that works with the already established infrastructure that organizations enjoy, and instead of further shifting focus onto newer and even greener pastures, a focus is being applied on perfecting these new features as they stand today. Gamification, while incredible and entirely visionary for the field of learning is not built out as much as designers and training administrators would like. The role of the disruptor in the learning space is currently to perfect these new processes and turn them into something that is entirely the vision of the learning client and helps positively shape experiences within the paradigm of learning. What is next for the learning industry? There is definitely more to come in the learning industry; the current focus is to make the end to end process feel more accessible. Instead of something that has been almost entirely compliance driven, more and more efforts are being placed on rounding out the entire offering. Providing situations where the complete picture of a role is thought out from the first interaction to some of the most difficult interactions an employee may face. How do we capitalize on existing knowledge? This is arguably the most immediate environment for an entrepreneurial mind. One of the largest problems with learning content in our industry is ensuring its effectiveness, as well as appropriately catering it to the needs of individual organizations. Especially, when considering the current climate in the pricing of custom learnings, and attempting to get something perfect based on our perceived requirements. We are not all instructional designers, and even when we are, there is a chance that on our own, we are unable to truly capture the requirements of the learners within our organization. In this stage of development outside eyes of like peers to point out areas in which we may have missed opportunities for greater learning are crucial.? For the outsider (and in this case the disruptor), it is imperative that employees, industry peers, and competitors alike are all considered, as they are a completely underutilized wealth of knowledge. An opportunist can capture the appropriate requirements of these given categories, and determine what they are doing to ready themselves for the future. Though there are organizations that already do this, the focus is not always on specific role capabilities or instituting a passive chain for knowledge transfer. This could be an exciting offering if approached properly, and could entirely revolutionize the manners in which we approach learning in each and every one of our organizations. How do we further the reach of our learnings? Practice makes perfect. Just like in school, often people cram for their big test and leave all the answers on the examination itself. We often remember very little, almost as if the knowledge was captured via the keyboard or writing utensil of which the examination occurred and removed from us entirely. Though learning innovators have approached this with some not so traditional methods, such as microlearning and gamification, there are definitively additional opportunities in this space. Imagine a comprehensive approach to facilitating once a day training within a short time window. That can be traceable and effective, giving appropriate tricks and tips on how to be more effective within certain roles within an organization. Or even better, completely editable content that is easy to configure without the help of any vendor whatsoever. This is the exciting future state of content in general. How can we ensure our learning and development program is properly fixated on organizational bottom line? At the end of the day, the mission of the organization should be the reason we seek to better ourselves. A disruptor realizes there is an untapped wealth to be found in the delivery of the right training to the appropriate staff, at the right moment. Just in time training may be the future of training itself, having the most impactful content could be the differentiator your organization has desperately craved since it first opened its doors. Imagine a picklist within your LMS that gives you access to any content available within a providers? system. This could be done and a virtual a la cart variety package could be an amazing way to close role gaps within your organization. The future is incredibly bright, and always very fun to ponder. With so many opportunities on the horizon and so many choices already in the learning mix, it is hard to argue the undoubted benefits of a learning and development department. Be sure to join me and Gyrus Systems as we further investigate the Learning industry and all that it entails here at the Gyrus Systems Blog. Also, do not forget to subscribe to this blog, with up to the minute content on new postings delivered straight to your email inbox!